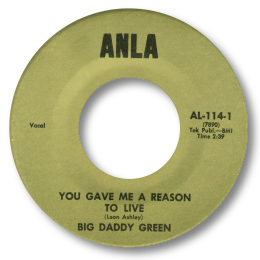 Big Daddy Green – a Louisiana singer with vocals to match his name. His first 45 was a bit of a disappointment (no it's not the Chris de Burgh song thank God) but his second was much stronger. Taken at a standstill pace You Gave Me A Reason To Live features his gruff tones over a simple but effective rhythm section with a lively bluesy lead guitar. Love the band’s shouts of encouragement towards the end of the track as well. Not quite as good an Anla 45 as the ones by Ike Porter or Charles Greene but still well worth picking up. UPDATE ~ Green's real name was Louis Charles Green and he came from Dayton, TX but spent most of his life in Lake Charles, LA. He played with swamp pop artists Cookie & the Cupcakes, Rockin' Sidney and the Alfred Pete group. He sadly passed away on 18 May 1998 aged 63. Note ~ The artist Charles Greene would seem to be another guy altogether. Thanks to Greg Burgess for the extra info and for the sad news about Green's death.